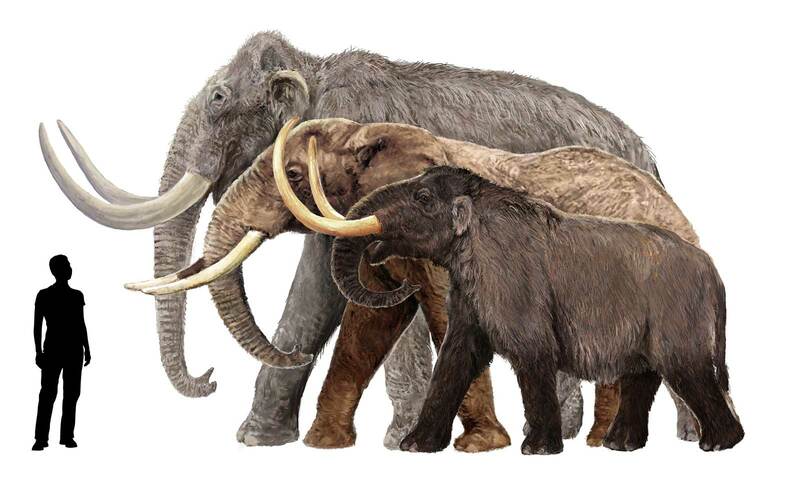 Sketch showing a Columbian mammoth, an African elephant, and an American mastodon next to a 6-foot-tall human. ©The Field Museum; Illustration by Velizar Simeonovski. Professor Adrian Lister, Natural History Museum, discusses how mammoths were represented in Ice Age art. Mammoths evolved in Africa and their spread parallels that of humans. The lecture will discuss how mammoth bones and tusks were used to construct huts and to carve tools and art objects. Photo: Sketch showing a Columbian mammoth, an African elephant, and an American mastodon (from back to front), next to a 6-foot-tall human. ©The Field Museum; Illustration by Velizar Simeonovski.